San Francisco is a destination city for visitors from around the world. There are many well-known common sites to see including the Golden Gate Bridge, Fisherman’s Warf, Chinatown, Haight-Ashbury, Alcatraz and Union Square. But, there are also an abundance of smaller museums, gardens and spots you might want to take in, next time you go. Here they boast “an aquarium, planetarium, and natural history museum—all under one living roof.” Indeed, located in Golden Gate Park at 55 Music Concourse Drive, it would take several days to see all it has to offer. It’s open daily, Monday – Saturday from 9:30am – 5pm, and Sundays, 11am – 5pm. There’s a diversity of ongoing exhibits including Water Planet, Animal Attraction, Human Odyssey, The Swamp, Gems and Minerals Unearthed, and the Color of Life. The Morrison Planetarium features a 75-foot dome which displays “one of the most accurate digital Universes ever created.” The planetarium shows are included in general admission. The Osher Rainforest is a four-story vibrant rainforest with free-flying birds and butterflies. Here there are more than 1,600 species of critters and plant life. Frogs, chameleons and tree boas climb among the plants, as well as beetles, silk orb-weaver spiders. Amazonian fish species swim past in waterways that run overhead. This 90-foot dome maintains a constant 82-85F degrees, and 75% humidity, and is the largest of its kind in the world. Close to 40,000 species live in the Steinhart Aquarium where a variety of ecosystems are located from a Philippine Coral Reef, the California Coast and Rainforests of the World. It is also home to an African Penguin exhibit and here is where kids can have all of the fun! Penguins and Pajamas Sleepovers are for kids only, unless you are lucky enough to be an adult supervisor. Included in this Academy of Sciences sleepover is an overnight stay in one of the exhibit areas and live-animal demonstrations. The Osher Rainforest remains open for the group until 8pm. 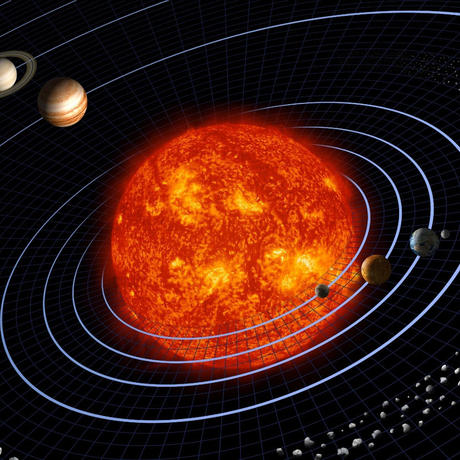 There are planetarium showings, a late night snack and early morning breakfast. Overnight parking is included in Music Concourse Garage, and the group has next day admission to the Academy. Other nighttime activities include NightLife, Behind-the-Scenes Tours and various lectures and workshops. Admission runs from $35.95 for adults; $30.95 for seniors, students and youth. Members visit the Academy anytime for free. Special events may cost extra. Visit the California Academy Sciences website, www.calacademy.org/, for more information. The Botanical Gardens is a living museum within Golden Gate Park. Located near the Japanese Tea Garden and the California Academy of Sciences, near the corner of Ninth Avenue and Lincoln Way, the Botanical Gardens open daily year-round at 7:30am. There are 55 acres of grounds containing more than 8,000 different plant species from around the world. Because of San Francisco’s unique mild temperatures, plant species are able to thrive, when not being able to live at any other locations, including several endangered species. The plant life is kept in various collections throughout the facility including the Magnolia collection, and two Cloud Forest collections – one for Mesoamerican plant life, another for the Andean collection. Mediterranean Climate habitats include Australia, and Chilean collections. The High Elevation Palms includes some palms that grow up at an elevation of 11,000 feet in their native habitats. One special collection is the Ancient Plant Garden. Here there are many non-extinct living plant groups some of which are known as “living fossils.” For example, you may find Chinese Rhubarb, Gunnera tinctoria, also known as Dinosaur Food. The plant has five-foot long leaves, with teeth on the underparts. A native to Central and South America, it is said to grow like a weed there. These plants are cut back in winter, and grow back with a vengeance in early spring. 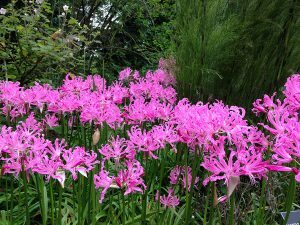 The South African Garden shows off with shocking pink fall blooms in November with the Guernsey Lily, Nerine bowdenii. Not a true lily, it is more closely related to Amaryllis. The Botanical Gardens offers docent-led tours, or you may enjoy the gardens at your own leisure. If you are a botany lover, you probably will not be able to see it all in one afternoon. Visit the Botanical Gardens website at www.sfbotanicalgarden.org/. Organized by a group of cartoon art enthusiasts, the museum maintains some 7,000 original cartoon pieces in its permanent collection. The collection includes original Disney animation art from the collection of Mike Glad; historic comic strip art from Charles Schulz (Peanuts), Bill Watterson (Calvin & Hobbes), Walt Kelly (Pogo), George Herriman (Krazy Kat) and Winsor McCay; political cartoons from Bill Mauldin and Lou Grant; comic book art from Bob Kane, Jack Kirby and Steve Ditko. It is managed by a board of trustees and has an advisory board of cartoonists, graphic artists, historians and authors. Through its history, the museum has produced nearly 200 exhibitions on topics ranging from politics and sports to children’s literature and Latino culture. It maintains a research library and hosts a variety of public programs. More about the Cartoon Art Museum can be found at www.cartoonart.org/. 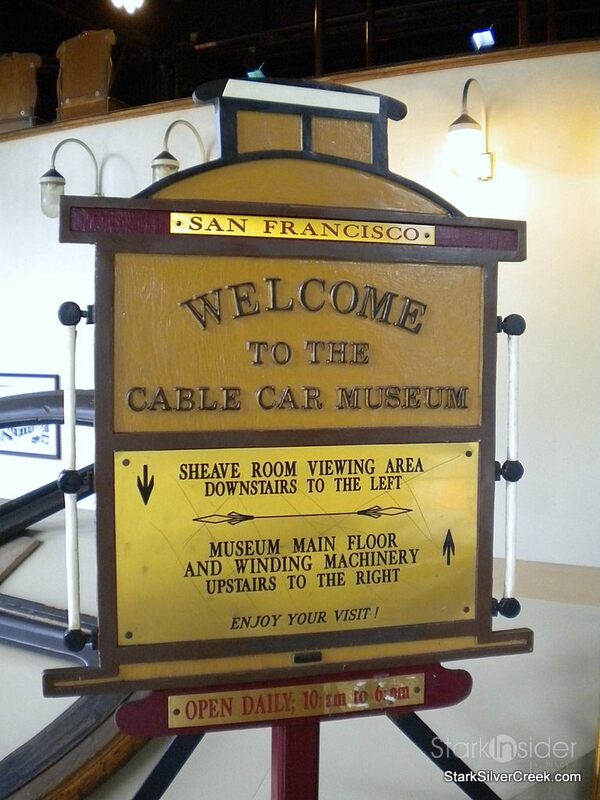 Alright, maybe this is a given with the continued modern-day use of cable cars in the city, but there is a history of them at the Cable Car Museum located at 1201 Mason St. Established in 1974, this museum is operated by the Friends of the Cable Car Museum as a nonprofit educational facility. It is appropriately located in the old Washington/Mason cable car barn and powerhouse on Nob Hill. History reveals the first cable car was tested by Andrew Smith Hallidie on Clay Street, in San Francisco, in August of 1873. Hallidie had entered into a partnership to form the Clay Street Hill Railroad, which started construction of a cable line on Clay Street in May, 1873. Clay Street Hill Railroad began public service on September 1, 1873. Some 53 miles of cable car track once traversed around the city. Repairs to maintain the current cable car systems are underway including gearbox rehabilitation scheduled to start this past September. Some lines may be down for up to eight-day periods throughout the next two years. The museum attracts cable car and rail enthusiasts as it houses three antique cable cars from the 1870’s – the only surviving car from the first cable car company, the Clay Street Hill Railroad, No. 8 grip car as well as the Sutter Street Railway No. 46 grip car & No. 54 trailer. Also on display are various grips, track, cable, models, and a large collection of historic photographs. For more information on the Cable Car Museum, visit www.cablecarmuseum.org/index.html. There is much more to see and do in this “City by the Bay.” Each time you go, you may discover something new, while visiting your favorite haunts.